Is that a temper tantrum or a sensory meltdown? Learning the difference between these two similar situations can help you handle them better the next time they happen. It’s important to note that for the most part tantrums and sensory meltdowns seem so similar that parents who are not familiar with autism may not even know sensory meltdowns exist. What Is The Difference Between a Temper Tantrum and Sensory Meltdown? Temper tantrums and sensory meltdowns both manifest in alike ways but occur for different reasons. So while the end result may be the same, the stimulus is very different. A temper tantrum is an outburst that occurs when a child is frustrated but cannot adequately explain or understand their frustration. For example, a tantrum may occur when a parent denies their child from having an inappropriate snack. Not understanding the parent’s reasoning, the child may begin to yell, cry, or lash out to express their feelings of malcontent. All they know is they want that snack and they can’t have it, and that makes them very upset. Sensory meltdowns, on the other hand, are common with those who are on the autism spectrum. They don’t happen because of anger or frustration, but instead are the body’s way of reacting to an over-stimulating situation. For example, a meltdown may occur due to sensitivity to bright lights or loud crowds, and can cause people with autism to become confused or even frightened. The easiest way to solve a temper tantrum — though not recommended — is to give your child whatever they want. However unlike tantrums, sensory meltdowns will not disappear as soon as the need or want is met. Children with sensory issues frequently feel out of control. Developing a positive relationship with your child by encouraging and facilitating their learning process can help to reassure your child that you are aware of the situation and are working to help minimize the stress and sensory overload. Incorporating a sensory diet may also help manage meltdowns. Take time out of your day to sit down and schedule specific activities into your child’s day to assist with attention and adaptive responses. Engage with your child in stabilizing and focus activities to improve their motor skills. 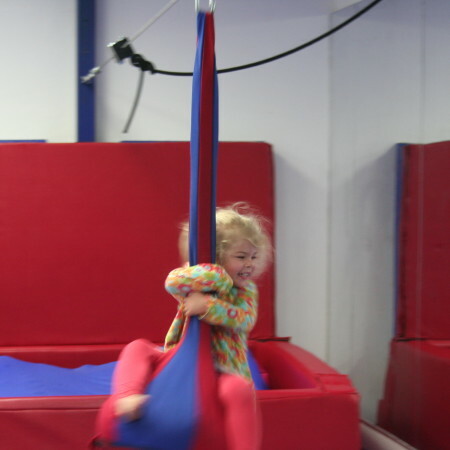 We Rock the Spectrum offers a number of specialized sensory equipment to exercise your child’s specific needs. Your child’s doctor or therapy team can often offer the best advice and alternative solutions for your child’s specific sensory needs. There are many ways to resolve a sensory meltdown, such as removing your child from the situation or allowing them to go through the entire meltdown independently. Your doctor can help decide which of these is the best choice for your child. Be aware of your child’s sensory cues to minimize meltdowns. For those who have sensitivity to noise, designate a place at home that they can go whenever they feel overwhelmed and need a break. Put together on-the-go kits that include earplugs for noise, sunglasses for light, headphones and a music player with their favorite music or sensory fidgets to keep hands busy. Some of our gyms even feature quite rooms for the kids to use if they need to cool down. This entry was posted in Autism Resources on March 11, 2016 by David TEST! Ephraim.